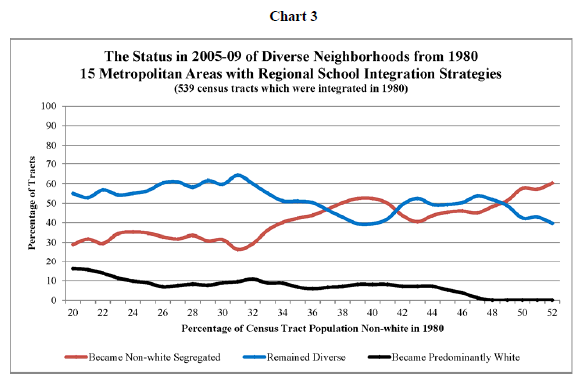 This morning we looked at a demographics paper by the Institute on Metropolitan Opportunity that looked at the phenomenon of suburban diversity, and found that while they tended to have tons of advantages over segregated communities (political balance, integrated schools, economic opportunity, increased cultural tolerance), they were also the least stable in terms of demographics. The data strongly suggested that while racially diverse communities were more likely to resegregate than segregated communities were to integrate, this was not a bidirectional phenomenon: it suggests that people of colour (PoCs) move in to white communities, while white people move out of integrated communities. The relevant question is why is this happening? Is this truly an example of white people being horrible xenophobes who hate brown people? Is it simple in-group preference wherein people simply prefer to live with people who look like them and/or share a culture? Perhaps it’s a cohort effect whereby white people in suburbs have been there longer as a group, and have therefore had more time to accumulate wealth – wealth they use to afford to live in ‘nicer’ neighbourhoods that PoCs simply can’t afford yet? Any self-respecting skeptic will likely recognize that it could be (and probably is) some combination of all of these things. The relative strength of each of these forces is going to vary widely due to factors geographic, historical, socioeconomic, academic – there’s a lot of moving parts to the equation. However, the authors point explicitly to a few mechanisms by which racial discrimination (systemic and otherwise) plays a major role in resegregating communities. Get ready to rage. Remember when I talked about the ‘push’ and the ‘pull’ that moved whites into the suburbs? The ‘pull’ was the increased affordability of housing thanks in a large part to the GI Bill, as well as massive federal investments in transportation infrastructure and electricification*. The ‘push’ was multifaceted – cities were crowded, dangerous, and dirty – but it would be naive to assume that racial dynamics did not play a major role. Well it turns out that in the absence of a federal program providing affirmative action opportunities to white people, the private sector has stepped up and begun engaging in a practice known as “racial steering”. This is when real estate agents guide white families looking to buy property into predominantly white (or unstably integrated) areas, while similarly diverting PoCs into non-white areas. In some cases cited by the authors, schools that were described as “good” to homebuyers of colour were described as sub-standard to white homebuyers. This occurred regardless of the credit history, income, and non-racial background. We’ve talked about the ‘predatory lending’ practices of major financial institutions that contributed to disproportionate harm to families of colour when the real estate market went pear-shaped*. Well it turns out that above and beyond that, middle- and upper-income black families are approximately 1.5-2.5 times more likely to be denied any kind of mortgage than white families with similar financial credentials. The authors also note that home loans are more likely to be approved in white-segregated neighbourhoods than in PoC-segregated neighbourhoods – integrated neighbourhoods fall somewhere in the middle. White-segregated communities are far less likely, through the use of zoning laws and agreements with developers, to have affordable housing (high-rises, apartments, high-density structures) built in their back yards, so to speak. Since housing affordability is predominantly a PoC issue, it is not difficult to see the racialized effect this will have, pushing poor PoC into PoC-segregated or integrated communities (and correspondingly driving white people out). Again, this is one of those things that have multi-generational effects that last well beyond the discontinuation of a given practice. Playing into the myth perpetuated by the real estate agents in point #1, white parents agitate to see their children sent to ‘whiter’ schools. This, despite the fact that the evidence strongly suggests that white children might do better in integrated schools, and at least will do no worse than if they attended an all-white school. As this practice continues, schools become ‘darker’, and thus easier to neglect and underfund (especially if it’s the rich kids leaving for whiter schools). The authors call attention to a study that found that if school boundaries were drawn to reflect school capacity and neighbourhood proximity, American schools would be more integrated by a factor of fifteen percent. This point is roughly a re-statement of #2, except dealing with poor people who need financial assistance rather than would-be home buyers who can only afford to live in PoC neighbourhoods. The authors note that while surveys state that both white people and PoCs express a desire to live in integrated neighbourhoods, the ‘tolerable proportion’ of integration is much lower for white folks than it is for PoCs. So yes, there does appear to be a role for good old-fashioned “I don’t like brown people” racism – at least we can rely on some things in this crazy world. If you’re not at peak rage levels yet, I should point out (as the authors do) that #1-#4 are all specifically prohibited by federal law, and yet are simply not investigated or enforced. Greta Christina talked about the reasons why atheists still have to fight despite the law being on their (our) side. The case is no different for people of colour facing white supremacist discrimination at a systemic level. It is all well and good to pass laws, but without proper enforcement we will continue to see this kind of discrimination rage on unfettered. The sad thing is that nobody’s life is made better by segregating these communities, and a lot of people’s lives are made measurably worse. That’s not even a zero-sum game, that’s just a big-time loss. This is a problem – a serious one. But it has a solution, so long as we have the courage and resolve to act. *One might argue that, in light of what we know about the economic stability of integrated communities, racial steering and predatory lending may have caused the housing collapse. They most certainly made it worse. Sundown Towns are also still a thing, though they don’t usually post the signs anymore, just discriminate in housing. I work in one. The region around Harrisburg, PA, colloquially consists of two parts – the ‘East Shore’ and the ‘West Shore’ of the Susquehanna River. The actual city of Harrisburg is on the East Shore. The West Shore is a suburb, a collection of small townships clustered around Mechanicsburg. It’s commonly referred to as the ‘White Shore’ instead of the West Shore, and it’s not a joke – in 2000 the census discovered that the area was in fact 97% white. James W. Loewen has done a lot of research into this phenomenon. My home town in OR is on that list. As of the 80’s, when I left, things hadn’t changed that much. Some, especially amongst the younger folks, but not much. Racial restrictive covenants in real estate documents are no longer enforceable but are still present. This probably falls under part of #2 above but I recommend having them stricken from any title or mortgage you may run into. The striking wouldn’t have a legal impact but would say to the various agents that you don’t support segregation. Point of order: there was such a program. It was called the GI bill. Basically, at that time POCs were much less likely to be veterans in the first place due to discriminatory recruiting practices, but even nonwhite veterans were either denied their GI benefits flat out, or were only given benefits to purchase an existing (rather than new built) house. Since the suburbs were all new construction at that time, white people got suburban houses, POCs didn’t. So you missed the part, like TWO SENTENCES EARLIER, when I said “The GI bill”. Honestly… I don’t even know how to respond to this comment. Terribly sorry, I think I must have misread that part of your post. I thought that you had said that the GI bill pulled people generally towards the suburbs, but that predatory lending and racial steering on the part of realtors helped overrode that pull in the case of POCs, leaing them in the cities and the suburbs lily white. My bad there.. Points 1 and 2 remind me of a rather unfortunate decision made up here in Nunavut during the initial planning for the new territory. Since the government is the biggest employer in the territory, they wanted to spread out the opportunity by decentralizing the government offices to several of the communities outside of the capital. So far so good, except that due to relatively poor educational outcomes for the majority-Inuit population (the reasons for which we don’t need to go into details about here), most of the government jobs, particularly the better-paying professional level jobs, wound up being filled by people from down south. Not that they’re all white, but they’re definitely not Inuit, which was part one of the problem. The second part was that all these newly formed offices and the well-paying jobs that came with them sparked a burst of new housing developments to give these government employees places to live (all of which was cost-subsidized to attract people to the remote areas). This wasn’t as much of a problem in the capital and the other two other major regional centres which had already been government bases during the N.W.T. era, and apparently had some on-the-ball city planners and made sure that any new development was always mixed between house lots and multi-unit housing. But in a lot of the other communities, all of the new government housing, and often the government offices themselves, got built in an entirely new, practically set-off sections of the town, creating a de facto segregation of the southern government workers from the people whom they are supposed to be serving. Not that any of this was deliberate, or at least I doubt it was given the demographics of the planning committees, but the effects were and are real enough, and as with any infrastructure choices, are really hard to reverse after the fact. I could think of examples of all the other points as well, to some degree or another, but the above was such an easily avoidable situation and of such recent lineage that it still gets me scratching my head. As it happens, my aunt works for the government in Nunavut. I don’t know the details, but she was asked to delay her retirement, and I believe that the purpose is to train a replacement. She’s definitely a white person from down South (comes from upstate NY), but she’s been up there at least 35 years. Probably not really relevant, but it’s not often I see people mention Nunavut. Are you sure that the first four are prohibited by federal law? Or let me rephrase them. It’s probably true that doing those things are prohibited if done for racial reasons, but those are normal parts of modern urban/suburban design that who is going to be able to tell? Because we’re looking at multiple axis here…both racial AND cultural, this is a particularly difficult nut to crack. Great analysis as usual Ian. Another important recent study that examines the intractability of residential segregation and references some of the points you outline here is US2010’s “Separate and Unequal: AAs, Asians & Latinos & the Neighborhood Gap”. Among other things the report debunks the notion that rising income levels amongst Afr-Ams translates into greater residential mobility and hence integration. This a direct legacy of post WWII Federal Housing Administration redlining policy, which was one of the biggest engines of white middle class suburbanization and black “ghettoization”. The FHA and other New Deal institutions such as the GI Bill, which you point out, built the postwar white middle class and helped consolidate white wealth–contrary to the revisionist Horatio Alger wet dreams of white conservatives that “we” never relied on big govt to get where “we” are. There is good analysis of the nexus of whiteness and de facto segregationist housing policies in David Roediger’s Working Towards Whiteness as well as Mike Davis’ City of Quartz (So Cal focus). I also recommend the Center for Reponsible Lending’s excellent 2010 report on racially disparate predatory/subprime lending policies in CA. On my reading list, although I haven’t purchased it yet, is the book Great American City: Chicago and the enduring neighborhood effect by Robert J. Sampson. Based on the review in Science, it discusses many of the same issues you mention and it may be a good companion read. I can’t give any personal review yet, too many other books on my list. For a little while, some of the local defense contractors had started purchasing land for campuses out in the boondocks of VA cuz the land was cheap and they could work together with the government to make new housing developments. So I found myself on a two-week roadtrip to bumfuck VA to install a few hundred workstations, and it was one of the creepiest experiences of my life. I grew up a military brat. I’m used to a pretty wide range of skin colors and accents. This was literally my first time in a town that, out of about two thousand residents, had maybe two African Americans. The only latinos there were contractors like us. We had three black guys and four latinos in our crew. We’d walk into a local restaurant or the ABC store or the local gas station and everyone inside would just get quiet. There was a soft hostility in the air that was almost palpable. I loved the clean air down there, but I think I’d choke on the social atmosphere if I’d had to stay much longer. When my husband retired from the US Navy in 1994, we moved to Austin. It seemed like a good idea at the time…. Anyway, we found a real estate agent through going to an open house. We didn’t want that house, so he pulled up some in our price range in the multiple listings for us. We pointed out a few that sounded interesting. He promptly told us, “Oh, no, you don’t want to live there. It’s much too dark over there.” We told him that comment was illegal. We complained to his office, and were told “People appreciate knowing that kind of thing.” !!! We found another agent the next day. #1-#4 are horrifying. You know, I’m not sure how to report those things even if I encounter them explicitly. That’s something I need to find out. If it’s illegal, do you tell the police? Like what are they going to do? On #5 (white preference), I said in the other thread I was happy in a white minority area (40%) and with schools that are even less white (20% maybe?). But I didn’t mention the intense pushback from my American in-laws on this subject. Obviously, any failures or misdeeds of my daughters will be my fault for insisting on sending her to a very non-white school. Racists know how to get you where you’re vulnerable! I wonder how many white residents of multiracial areas have to deal with that sort of thing? Does gentrification also play a role? You don’t seem to have touched on it directly, but I’m presently observing a trend in the area of Milwaukee that’s hip with my group where more and more White people (myself included) are moving into a previously-all(nearly all)-Black neighborhood, and the area is starting to get “nicer” due to increased private capital investment (which may or may not be a response to demographic shifts, though the cynic in me says that Whiter neighborhoods are likely viewed as safer investments). I imagine increasing property prices are not far behind, which in turn might drive out more of the disproportionately-impoverished darker-skinned residents.